Over the many years of creative work in America, Vytautas Kazimieras Jonynas decorated more than 80 buildings, most of which were sacred spaces. His decorative elements were renowned for their originality and imagination. Their expression in stained glass, sculpture and mosaics conferred a distinctiveness and unique character to each structure. This article is a continuation of a previous article in the Sep/Oct issue that described the early works and life of Jonynas in Europe. A turning point in the career of V.K. Jonynas came in 1954 when Rev. Antanas Deksnys of East St. Louis IL made him an offer to design the interior of a new church. Although Jonynas had not worked with stained glass before, he accepted the challenge. He rented space in a stained glass studio, where he set up a workshop. In the evenings he learned the technique of crafting art glass from George Kirchberger, an artist professionally trained in Munich. 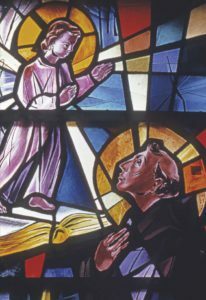 Determined to make stained glass his new artistic medium, Jonynas opened his own studio in 1955, specializing in ecclesiastical art. Donald Shepherd, his student at the Catan-Rose Institute of Arts, partnered with him to form the Jonynas & Shepherd Art Studio, Inc. in Queens, NY. George Kirchberger and Vytautas Ignas joined their team. The group soon embarked on major commissions from two Lithuanian parishes in Illinois. Our Lady of the Gate of Dawn. East St. Louis. Stained Glass. Charged with designing Immaculate Conception Church in East St. Louis IL (1955), architect Jonas Mulokas and Vytautas K. Jonynas turned away from classical architecture. The progressive outlook in American architecture encouraged them to take a risk and develop a contemporary Lithuanian style. Thus the bell tower of Immaculate Conception Church has a tapering form, crowned with a rooftop, recalling the design of Lithuanian wayside shrines. Pastor Rev. Antanas Deksnys gave Jonynas a free hand in decorating the interior of the church. The altar is adorned with a cross and wood carvings of angels. 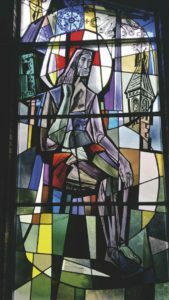 The stained glass windows, designed in predominantly deep blue and other dark colors, depict Madonnas from all over the world. Round windows in the clerestory portray King Mindaugas and other historic Lithuanian figures. In recognition of its exceptional artistry, the State of Illinois has named Immaculate Conception Church an architectural landmark. The Nativity of the B.V.M. Church in the neighborhood of Marquette Park was the first edifice built by postwar Lithuanian immigrants in Chicago (1957). Both architect Mulokas and artist Jonynas drew upon Lithuanian folk art influences in develping their designs. Jonynas incorporated stylized folk ornaments in the plaster capitals of floral ornaments in the archways. Jonynas had proposed a wood altar for the church, but pastor George Paškus chose baroque Italian marble altars, instead. Fourteen stained glass windows by Jonynas freely interpret the images and apparitions of the Blessed Virgin. The chancel windows depict historic Lithuanian images of the Blessed Virgin Mary of Pažaislis, B.V.M of Kalvarija, Our Lady of Vilnius, and B.V.M. of Trakai. The windows in the nave of the church portray other images of the Blessed Virgin Mary, along with St. Casimir and St. Michael the Archangel. Architect Mulokas was commissioned by Rev. Jonas Balkūnas to design a new church for the Transfiguration Parish in Maspeth NY (1962) and Jonynas again collaborated on its interior design. The two artists designed in a modern style, utilizing advanced technology and materials: the exterior glass and aluminum façade incorporates Jonynas’ art glass, the worship space is columnfree, adding to the visual lightness. Jonynas proved to be a highly original decorator, crafting stained glass windows, the wood altar, Stations of the Cross, Baptismal font, and light fixtures, and setting the wood sculpture of Christ and the Apostles in the apse against a blue mosaic background. V. K. Jonynas and J. Mulokas won the New York Chamber of Commerce architecture award for their Church of Transfiguration project. The stained glass windows for the Franciscan Monastery in Brooklyn (1959) were composed in a stylized, semi-abstract manner. The art glass backdrop for the altar portrays a powerful image of Christ before His crucifixion―the darkness in Christ’s eyes evokes a feeling of anguish and suffering. The other windows depict St. Francis, St. Anthony, Our Lady of Sorrows and other saints. St. Francis, detail. St. Anthony Chapel, Kennebunkport. The windows in St. Alphonsus College Chapel in Suffield CT (1963) are oriented vertically. As in the Notre Dame chapel, the figures of saints and angels appear to ascend dramatically skyward. 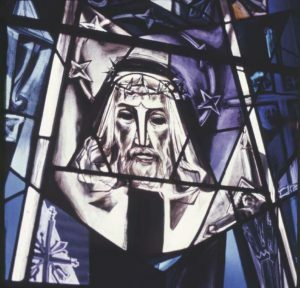 Jonynas created the stained glass windows for the historic St. Mary of the Angels Lithuanian Church in Brooklyn in 1964. After the parish closed, the windows were installed in the Our Lady of Vilnius Church in Manhattan in 1981. After this parish closed, the windows were shipped to Lithuania in 2013. Currently, the window depicting Fatima is on display at the Beatričė Kleizaitė Vasaris Gallery in Marijampolė. Jonynas returned to Franciscan Fathers Monastery in Kennebunkport ME to design the interior of St. Anthony Chapel (1966). The bas-relief reredos (ornamental screen or partition wall behind an altar) depicts Jesus, Mary and Joseph flanked by Lithuanian crosses and Franciscan landmarks in Lithuania. The windows on the left side are constructed of slab glass elements with unique sculptured inserts. The inserts create surfaces for illumination when the windows are dark and the church is lit from within, but at dawn, when sunlight streams though the windows with an interplay of vivid color, the images of Our Lady of Vilnius, St. Casimir and the Pensive Christ come vibrantly alive. Additionally, a large window titled “Canticle of the Sun” fills the vestibule with brilliant light. At St. Aloysius Church (1967) in New Canaan CT, Jonynas designed the art glass windows and bas-relief panels. At St. Thomas More Church in Darien, CT (1973) Jonynas executed the windows, Stations of the Cross, and a sculpture of St. Thomas More. “The Triad” bas relief panel for Vatican Pavilion, 1964. Installed at Franciscan Friary, Kennebunkport, ME. Jonynas & Shepherd Studio was commissioned to create the art layout for the Vatican Pavilion at the 1964–65 New York World’s Fair. Eleven allegorical bas-relief panels sculpted by Jonynas represent the Holy Trinity, the Church and the Sacraments. The largest panel is named “The Triad” depicting the Church Militant, the Church Suffering and the Church Triumphant. Made of polystyrene and embedded with particles of colored glass, the bas-relief structures attested to Jonynas’ skill as sculptor and architect. The golden anodized aluminum cross crowning the Pavilion and the steel altar table in the chapel exemplified his metalworking craft. After the Fair closed, the altar was installed in St. Brendan’s Church in the Bronx. The largest of the Holy Trinity panels has been preserved and installed on the grounds of the Franciscan Monastery in Kennebunkport, ME. Our Lady of Šiluva Chapel at the Basilica of the National Shrine of the Immaculate Conception in Washington D.C. was dedicated in 1966. Jonynas executed two mosaics for the side walls of the chapel, one portraying the life of St. Casimir, the other portraying the Pensive Christ overlooking scenes in Lithuania. 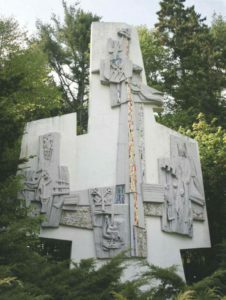 Also in Washington D.C., Jonynas designed the altar, Stations of the Cross, and the interior appointments for St. George Episcopal Church (1971). 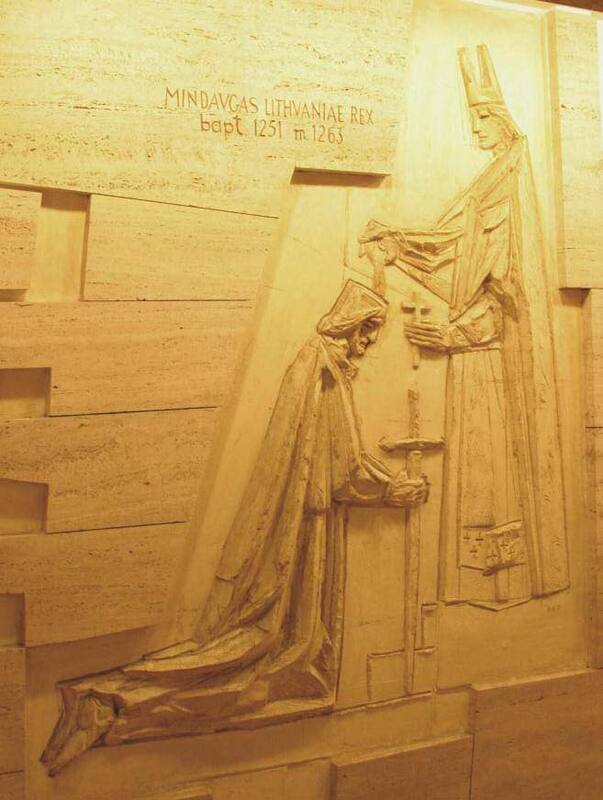 At St. Peter’s Basilica in Vatican City, Jonynas designed the Mater Misericordiae Chapel in memory of Lithuanian Martyrs. The project was conceived much earlier by bishop Juozapas Skvireckas in 1953 (then living in Austria), when excavations in the lower level of St. Peter’s Basilica made space available for a chapel. A decade later, Cardinal Antonio Samorè, who had been Secretary of the Vatican’s nunciature to Lithuania in the 1930’s, asked Pope Paul VI to grant permission to build the chapel. Cardinal Samorè’s personal secretary bishop Paul Marcinkus, bishop Vincentas Brizgys and Stasys Lozoraitis organized the Lithuanian Martyrs Chapel Committee and Jonynas received the commission. The altar is adorned with a mosaic portrait of Our Lady of Vilnius, venerated under the title of Mother of Mercy until 1570. The side walls are decorated with bas-relief images of the Baptism of Mindaugas, churches of Vilnius, St. Josaphat, St. Casimir, and images of a Lithuanian prayer book written in Siberia. The chapel was dedicated on July 10, 1970 with a Mass celebrated by Pope Paul VI. Mater Misericordiae chapel in the Vatican, depicting King Mindaugas. St. Anne’s Chapel at St. Casimir’s Cemetery in Amsterdam, NY (1971) was funded by J.V. Kiškis as a memorial to his wife Anne. Jonynas designed the chapel in a brutalist style, inspired by Le Corbusier’s Ronchamp Chapel. The entrance façade consists of three pylons. The central concave pylon has a cast-aluminum sculpture of Christ (Rūpintojėlis) on the facade. It is capped with a canopy crowned by ornamental rays of the sun. The exposed brick interior serves as a foil for an aluminum sculpture of the Risen Christ and tall dalle-de-verre or slab glass windows that surround the black marble altar. 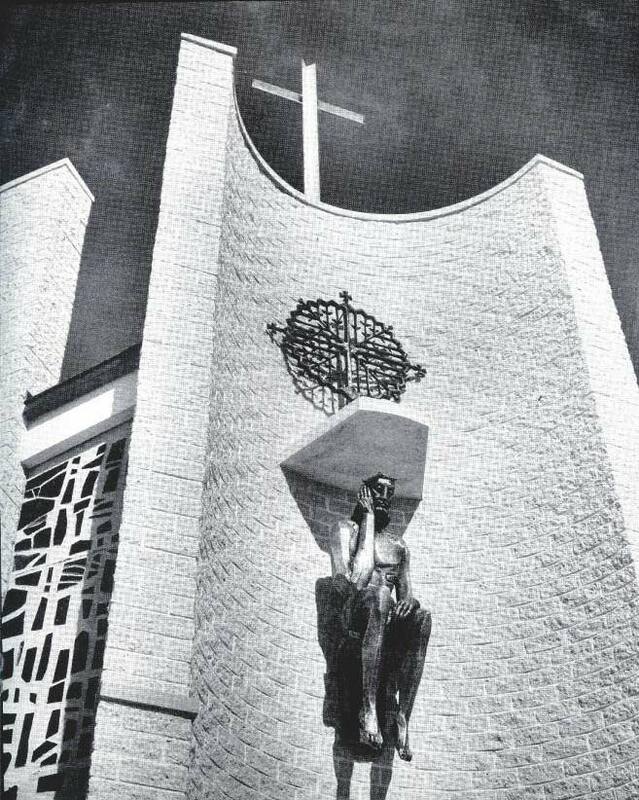 The Divine Providence Lithuanian Catholic Church in Southfield MI was designed by Canadian architect Alfonsas Kulpa (1973). Jonynas designed the asymmetrically laid out leaded stained glass windows which depict the Holy Family, Pensive Christ, and St. Casimir. Jonynas also designed a bas-relief panel and the lectern. In 1974 the City of New York commissioned Jonynas to create murals for the dining room of the Correctional Facilities of Rikers Island. 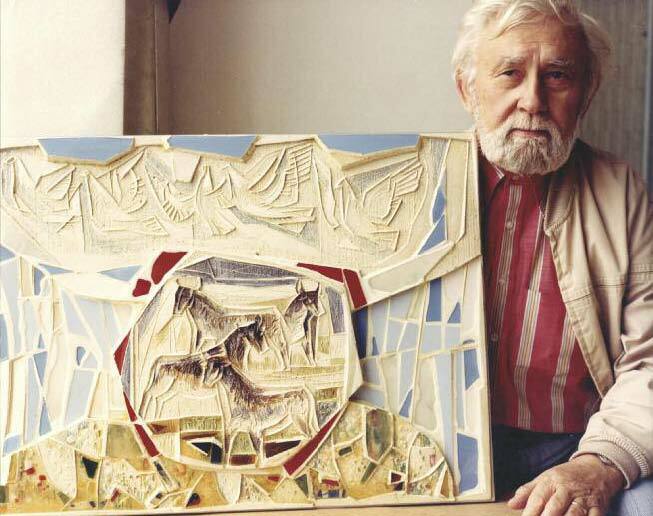 He combined sculpture, mosaics, murals and glass in five unified pieces of art, each of them a monumental 9 by 12 feet in size. The abstract murals depict the seasons, landscapes, birds and fish. St. Anne’s Chapel, Amsterdam, NY. A new church for St. Peter and Paul Parish in Tamaqua, PA was built in 1976. Jonynas authored a bas-relief of the Risen Christ and the stained glass windows for this Lithuanian church. His last liturgical art commission came from St. Catherine Church in Moscow, PA (1983), for murals and a bas-relief of the Risen Christ. Jonynas & Shepherd Art Studio was dissolved in 1980. Jonynas’ legacy of ecclesiastical art numbers some 2,000 decorative objects. 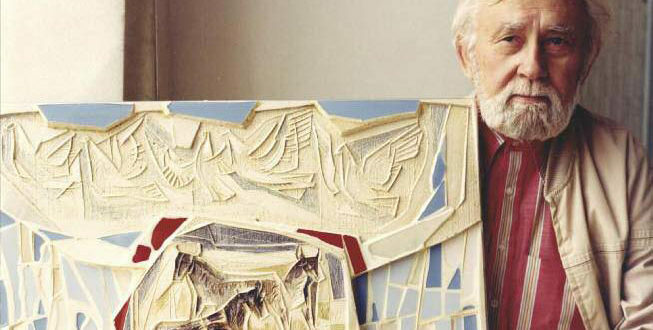 The majority of his work is found in the United States, eight pieces in Vatican City, one in Australia and several in Lithuania and in Freiburg. 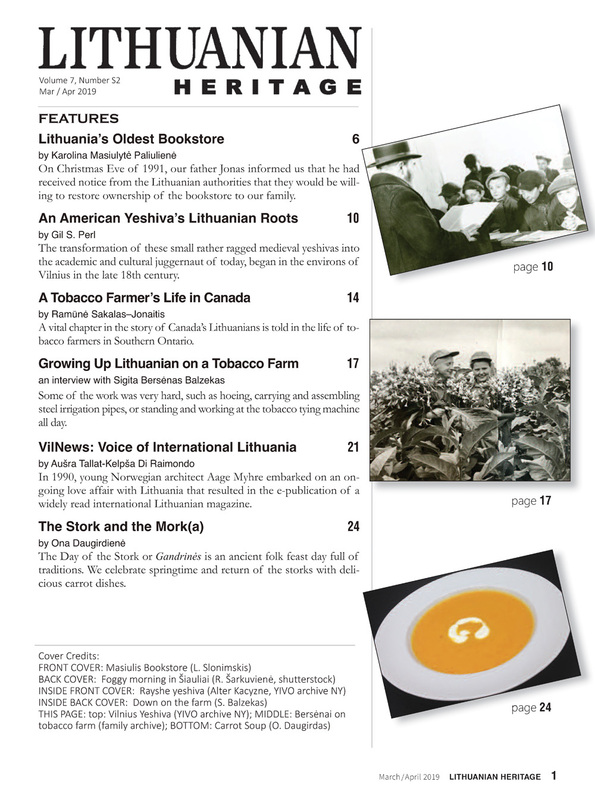 Jonynas never severed his Lithuanian ties – he first revisited Lithuania (then under Soviet occupation) in 1967, and after decades of obscurity, he was rediscovered in his native land. Jonynas broke barriers by being one of the first Lithuanian American artists in the diaspora to exhibit his work in Kaunas. Pensive Christ. Divine Providence Church in Southfield, MI. In 1987 an exhibit of his graphic art, watercolors and sculptural art was held at the Lithuanian Museum of Art in Vilnius. Jonynas greeted the attendees: “Our heroes lie not in graves. 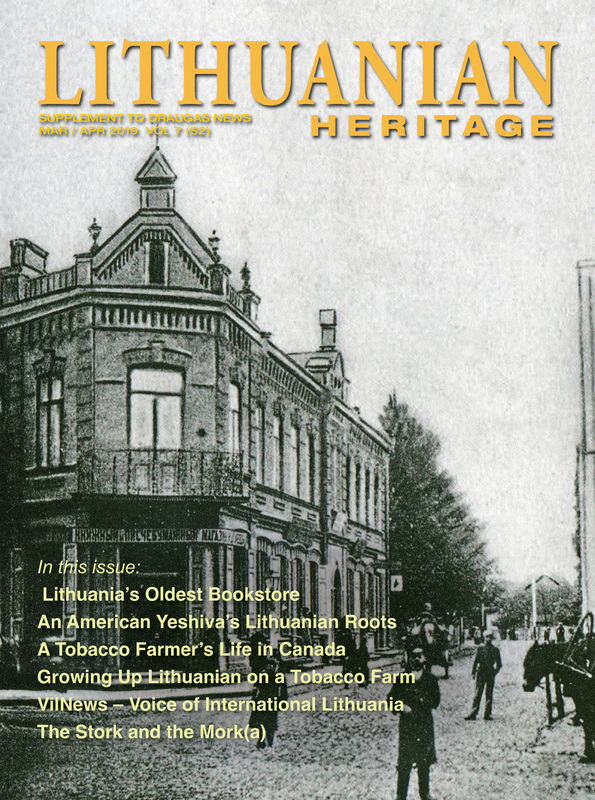 In today’s Lithuania they are alive, walking among us in our cities, villages and fields. The Earth is watered not only by the sweat and labor of the plowmen, but by the strivings of our educated people, who endeavor to keep our native language alive. They strive for education that will blaze the path to a sunny future, and for arts that will strengthen our souls and our selfconfidence.” Although the nation was not yet free, Jonynas longed for a Lithuania that would once again be open to Western culture. After the restoration of Independence in 1990, Jonynas often visited Lithuania. In 1993 he was awarded the Commander’s Cross of Grand Duke Gediminas, and witnessed the opening of the Jonynas Gallery in the M.K. Čiurlionis National Art Museum in Druskininkai. The Gallery houses the Jonynas archive – a large collection of his early work and sculpture.